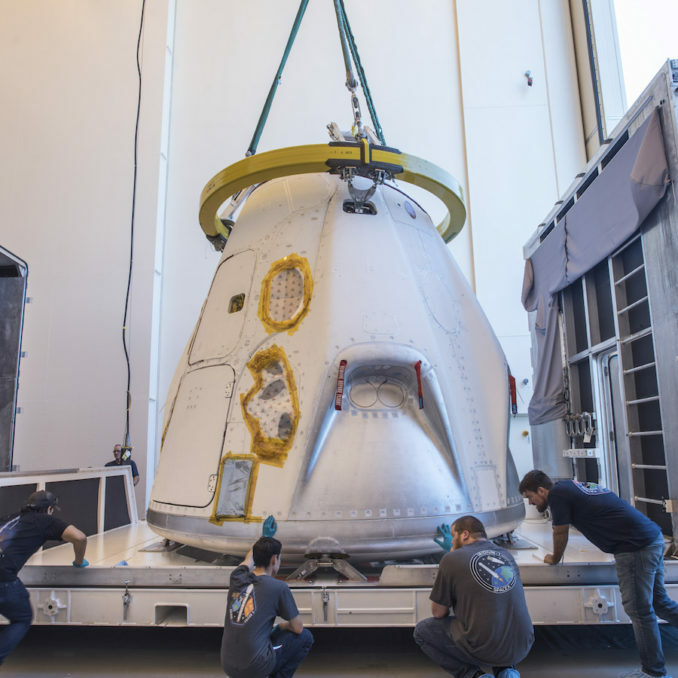 SpaceX’s first Crew Dragon spacecraft, a capsule designed to eventually carry astronauts on treks to the International Space Station, has arrived at Cape Canaveral to begin preparations for launch on an unpiloted test flight later this year. But a target launch date for the uncrewed demonstration mission remains undecided, as officials assess the readiness of the Crew Dragon capsule, its unpressurized service module, or trunk section, its upgraded Falcon 9 rocket, and the space station’s availability to receive the spacecraft. 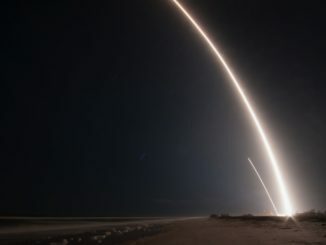 The most recent date officially communicated by NASA and SpaceX targets liftoff of the Crew Dragon’s unpiloted test flight, called Demo-1, in August. 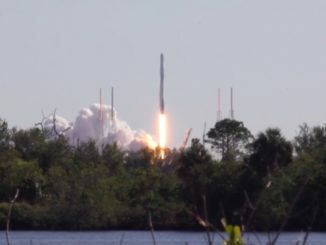 But that’s not going to happen, with the earliest possible launch date for Demo-1 now expected some time in the fall, according to multiple officials and internal documentation reviewed by Spaceflight Now. Another test flight, using a second space-worthy Crew Dragon spaceship, is expected in early 2019. A more definitive target date has not been released by SpaceX or NASA, and a SpaceX spokesperson did not respond to an inquiry requesting a fresh schedule for the Crew Dragon demo flights. The Crew Dragon spacecraft assigned to the Demo-1 mission arrived at Cape Canaveral after completing testing at NASA’s Plum Brook Station in Ohio in recent weeks. Inside the giant NASA-owned test chamber –the largest of its kind in the world — engineers subjected the capsule to the extremely cold, airless environment of space to ensure it could withstand the conditions. The testing apparently went well, and ground crews at Cape Canaveral will spend the next few months outfitting the capsule with sensors, parachutes, propellant and other gear needed for the test flight. 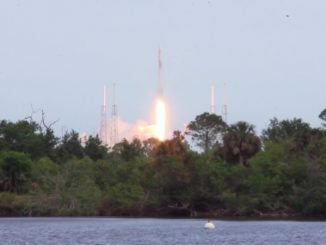 Janet Kavandi, a former astronaut and current director of NASA’s Glenn Research Center, which oversees the Plum Brook Station facility, said Monday that SpaceX had finished up reverberant acoustic and thermal vacuum testing, and the Crew Dragon capsule had departed Ohio. 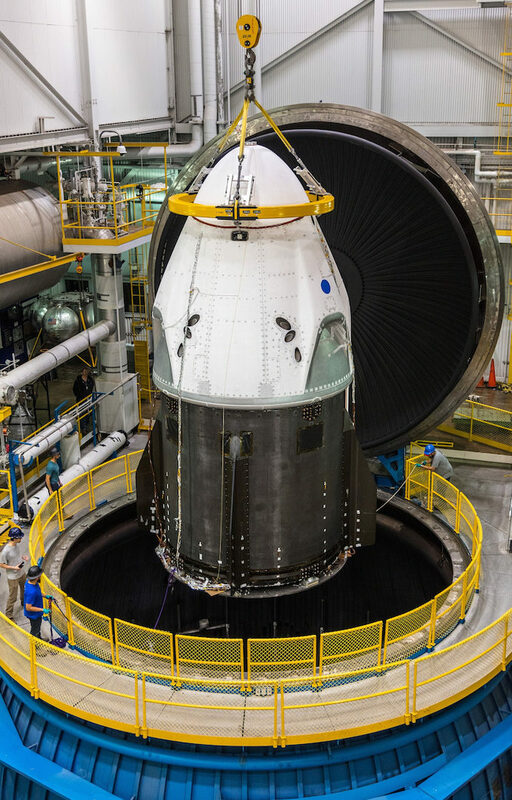 The Crew Dragon spacecraft was manufactured at SpaceX’s headquarters in Hawthorne, California, before going to Plum Brook for environmental testing, and finally shipping to Florida’s Space Coast for launch preparations. Production of the Falcon 9 rocket slated to launch the Demo-1 mission is nearing completion in Hawthorne. The launcher is based on SpaceX’s upgraded Falcon 9 Block 5 configuration, which made its first successful flight in May, but the vehicle assigned to Demo-1 will debut redesigned upper stage helium pressurant tanks, pressure vessels which include technical fixes to address the likely cause of a Falcon 9 rocket explosion on the launch pad in Florida in 2016. Fitting the Crew Dragon’s Demo-1 mission and the first orbital test flight of the CST-100 Starliner spacecraft, built by Boeing, NASA’s other commercial crew transportation provider Boeing, into the space station’s manifest of visiting crew and cargo vehicles will also help determine when they will launch, according to Kirk Shireman, NASA’s space station program manger. A report released by the Government Accountability Office on Wednesday suggested further delays are expected in the certification of SpaceX’s Crew Dragon and Boeing’s CST-100 Starliner spacecraft. NASA is funding the two commercial crew spacecraft to end its reliance on Russian Soyuz crew ferry vehicles for flights to the space station. In 2014, NASA agreed to a $4.2 billion contract with Boeing and a $2.6 billion deal with SpaceX to develop, build and fly the companies’ CST-100 Starliner and Crew Dragon spaceships. At that time, NASA and its two commercial crew contractors expected to have the new vehicles certified for regular crew rotation missions to and from the International Space Station by the end of 2017. But technical hurdles and several redesigns of the the spacecraft have delayed Boeing and SpaceX’s first orbital test flights until later this year, and astronauts will not fly on the commercially-developed capsules until demonstration flights in early 2019. 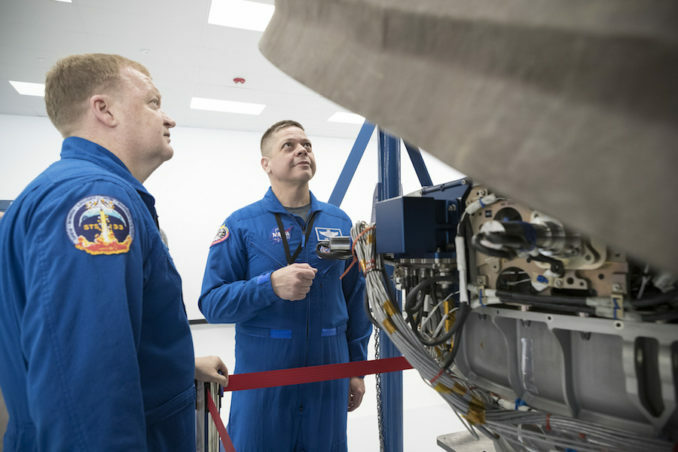 Then will come extensive reviews of the test flights’ results before NASA certifies the vehicles to carry long-duration crews between Earth and the space station. While Boeing and SpaceX’s most recent public projections indicate they will complete the certification process in January and February 2019, respectively, NASA’s own schedule analysis suggests that milestone will likely come nearly a year later. NASA and Boeing have agreed to potentially use the CST-100 Starliner’s crewed test flight, which originally was supposed to launch with a Boeing test pilot and a NASA astronaut, to carry a passenger who would stay aboard the space station for a long-duration months-long stay. These measures are aimed at reducing the risk of a gap in U.S. crew access to the space station, a major topic addressed in the GAO’s report earlier this week. NASA has decided not to purchase additional Soyuz seats from the Russian government, and officials say there is a three-year lead time required to build new Soyuz spacecraft, eliminating any chance for the U.S. space agency to buy more seats for astronauts launching in 2020. Once the Boeing and SpaceX crew craft are flying, NASA and Roscosmos plan to put one of their crew members on each U.S. and Russian crew launch to the space station. That means U.S. astronauts will continue launching on Soyuz missions, but NASA will provide the same opportunity for Russian cosmonauts on U.S. vehicles in an in-kind arrangement, ending NASA’s payments to Russia. In the worst-case scenario, neither company will be ready to begin crew rotation services to the space station until August 2020, according to NASA’s schedule analysis. Echoing concerns raised by Congress and NASA’s Aerospace Safety Advisory Panel, the GAO said NASA “lacks a consistent approach to assess key safety metrics” on the commercial crew vehicles. Safety officials are concerned neither company will meet NASA’s contractual requirement of a 1-in-270 probability of losing a crew on a CST-100 Starliner or Crew Dragon mission. NASA officials have said the primary driver behind the difficulty of meeting the 1-in-270 loss of crew, or LOC, requirement stems from hazards posed by space junk, which could collide with the capsules in orbit. Engineers are reviewing options, such as in-orbit inspections of the vehicle’s heat shields, to mitigate the risk. The GAO’s report also outlined several additional “top risks” facing each commercial crew capsule during development. SpaceX’s top risks include the safety of the Falcon 9 rocket’s new helium composite overwrapped pressure vessels, which will launch for the first time on the Demo-1 mission, and cracking discovered in the turbines of Falcon 9 rocket engines. The new-generation Falcon 9 Block 5 design includes changes to address the cracking risk. NASA is also also considering whether to approve SpaceX’s plan to load liquid propellants into the Falcon 9 rocket with astronauts already strapped in to their seats on top of the launcher. For Boeing, the top risks include concerns with the CST-100 Starliner’s abort system, parachutes, and the United Launch Alliance Atlas 5 rocket it will ride into orbit. Wind tunnel testing and data gather during an upcoming pad abort test will confirm the effectiveness of the abort system, the GAO said. There is also a concern that the forward heat shield, which will jettison from the CST-100 Starliner on descent, may re-contact the spacecraft after separation and damage its parachute system. NASA and Boeing are still assessing whether that possibility is acceptable, the GAO said. Boeing’s commercial crew missions will land with the aid of parachutes and airbags at one of several possible desert locations in the Western United States. The CST-100 Starliner’s early landings are likely to target White Sands, New Mexico. Crew Dragon capsules will come back to Earth with parachute-assisted splashdowns at sea. SpaceX has shelved earlier plans to use the Crew Dragon’s rocket thrusters for propulsive, precise touchdowns on land. NASA’s commercial crew managers may have insufficient data from Boeing’s launch contractor, ULA, to determine if the Atlas 5 rocket is susceptible to “cracking that could lead to catastrophic failures,” the GAO wrote in its report. NASA is also concerned its engineers may not have access to data on the Atlas 5’s RD-180 main engine. The information is restricted by agreements between the U.S. and Russian governments, the government watchdog said. With the departure of SpaceX’s Crew Dragon capsule earlier this month, NASA’s Plum Brook Station is preparing to host new spacecraft for testing. “On the space side, we’re really getting a lot of use out of those test chambers out there,” Kavandi said Monday at the American Insitute for Aeronautics and Astronautics Propulsion and Energy Forum in Cincinnati, Ohio. Next up for Plum Brook Station will be a series of ground tests on the launch abort system for NASA’s Orion crew capsule, a vehicle intended for missions to the moon and other deep space destinations. The combined crew and service modules for the next Orion spacecraft, scheduled for a long-delayed unpiloted test flight around the moon in 2020, will also be put through acoustic and thermal vacuum testing at Plum Brook Station. Other commercial space companies, such as Blue Origin and Sierra Nevada, plan to use the Plum Brook Station facility for testing.